Back in June of 2005 I posted a review of TSMManager 4.0. When I was with IBM I had convinced management to purchase the product and we got a sweetheart deal to boot. I was initially drawn to the nice admin console window. As you'll see in the picture below when you open an admin console you are presented with a tabbed window that has a number of different views, one per tab. The first tab is the ALL MESSAGES tab that is basically an active view of the TSM servers activity log. The second tab is the most useful and important tab within TSMManager, in fact it is what makes TSMManager my favorite tool to use. This tab is the ERROR MESSAGES tab and it basically filters the TSM activity log to show only WARNING, ERROR, and SEVERE ERROR messages. Why is this the most important piece to TSMManager? Because, with this one tab 95+% of the time I can deduce a problem within in a minute or two. 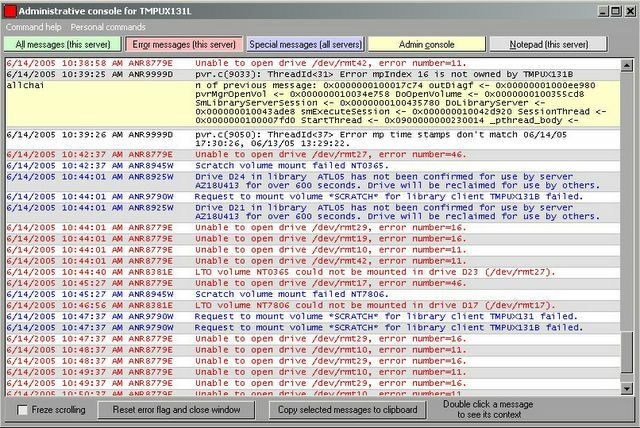 For example in the provided screen shot you can see we had a number of drive errors, but look closer and you see it's one tape causing the problem. This took me a minute to figure out and I easily resolved it by removing the tape. The next tab I rarely use but it can come in handy. It is the SPECIAL MESSAGES tab and it covers ALL the servers not just the one you have selected to manage at the moment. It really lists the processes and there start and end times. You might use the tab to lookup processes and how they ran, but I haven't found a real use for this tab yet. The next tab is the actual TSM Admin command line. You can issue commands or use the quick commands provided on the side. TSMManager will store the last 20+ commands in a buffer for recall. Overall this window and its tabs are worth the cost of the product in its productivity enhancement.